The state of South Dakota is a leader in the U.S. in wind power generation with over 30% of the state's electricity generation coming from wind in 2017. South Dakota has 583 turbines with a total capacity of 977 megawatts (MW) of wind generation capacity. South Dakota is one of the country's windiest states, and has the potential of installing 882,000 MW, and generating 2,902 billion kWh/year. Just as in Texas, the construction of new wind farms is transmission line limited. South Dakota's first wind farm was the South Dakota Wind Energy Center, built in 2003. The following is an incomplete list of wind farms. ^ "South Dakota Wind Energy" (PDF). U.S. Wind Energy State Facts. American Wind Energy Association. Retrieved 27 December 2017. 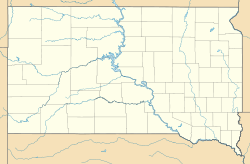 ^ "43-wind turbine farm in southeast South Dakota now producing power". Rapid City Journal. 14 June 2015. Retrieved 14 June 2015. 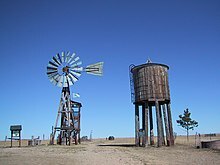 Wikimedia Commons has media related to Wind power in South Dakota. This page was last edited on 13 May 2018, at 21:20 (UTC).